Hedgehogs raised domestically make interesting pets, but require close attention to their health needs. Here is information on housing, feeding, health care, raising, and maintaining the proper environment for this small spiny mammal. 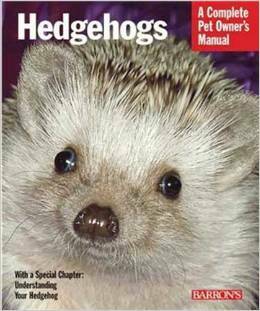 Also included is information on reproduction of hedgehogs and understanding their traits.All titles in Barron’s profusely-illustrated Complete Pet Owner’s Manuals introduce inexperienced and prospective pet owners to the pleasures and duties of pet care. They also make ideal guides for older children having their first experiences as animal caretakers. Attractively illustrated and filled with helpful information, Barron’s Complete Pet Owner’s Manuals advise on purchasing, housing, feeding, health care–and where applicable, grooming and training pets.